Well folks, it's that time of year again. 2017 is among us & I don't know about you but I'm taking these first few days to think back, regroup, & plan for an awesome year. I have to admit, I may not have reached my 2016 Goodreads Goal this year but I feel that I still kicked a$$ where reading is concerned. Read 38/50 books for my 2016 Reading Challenge. That's 76% & even though I can't recall how many books I read in 2015, I'm pretty sure I blew that number out of the water. Shared 21 book reviews with y'all. That's right- 21 amazing reviews shared. Check out my overall 'Book Reviews' list to see what all I've shared since beginning this blog. Started a Pinterest group board for book reviews. I look forward to watching it's growth throughout the new year. If you want to join, just let me know your Pinterest name or email below. 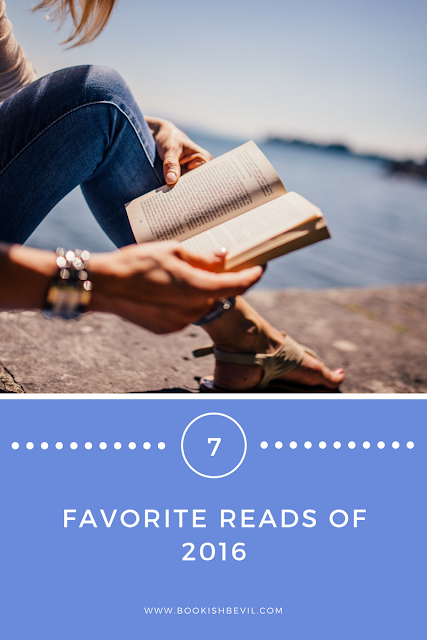 What were some of your 2016 Reading Achievements? 1. 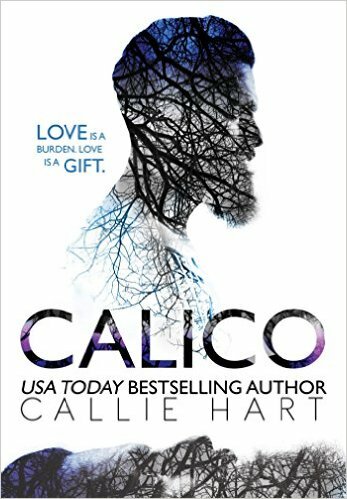 Calico by Callie Hart: This full length standalone novel was everything I've grown to expect of Callie Hart... and so much MORE! Not to mention- look at that cover?! After reading it on my Kindle, I've definitely added it to my list of books to purchase for my shelf. And trust me- you should too! Synopsis: Coralie Twelve years ago, I ran to stay alive. Port Royal, South Carolina, was my home. I was born there. I fell in love there. And I nearly died there. I never thought I’d go back. Now, after so many years, I have to return to bury the man who made my life a living hell. Some nights, I used to cry myself to sleep, praying my father would die. Other nights were different. Other nights, there was him. Callan Cross. My first confidante. My first kiss. My first love. My first everything: Callan was the glue that held me together when everything else was falling apart. He was my savior. He was there for me whenever I needed him… Until he wasn’t. Every night, I’ve seen the love of my life in my sleep. I just never thought I’d have to face him again. Callan Twelve years ago, I f*#@ed up big time. Living life through a camera lens is sometimes easier than dealing with it head on. Scratch that. It’s always easier. For over a decade, I’ve been a master of my art, taking photographs all over the world. Yet despite all of the countries I’ve visited, the amazing things I’ve seen, the beautiful women I’ve screwed, my heart has remained in pieces. Coralie’s the only woman I’ve ever loved, will ever love. And I’m determined to show her that we’re meant to be together. Even if it means unearthing the bones of the past in the process. A lifetime and a thousand miles have stood between us. Now, there’s no length of time I won’t wait, no distance I won’t travel, in order to make her mine. 2. 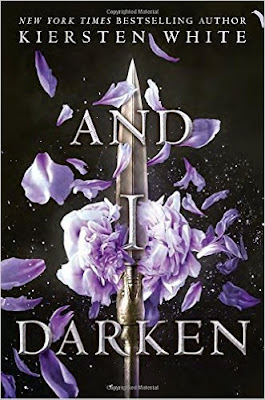 And I Darken by Kiersten White: Having heard this book mentioned a few times on 'Booktube', I decided to take the time to check it out from my local library. It's a hefty book that can be intimidating at first glance. Once I started reading though- I was hooked. I mean... I could not put it down. 3. The Diviners by Libba Bray: I shared in my review of this book that I actually did not read it right away. It actually sat on my shelf f.o.r.e.v.e.r before I made myself sit down & start reading. (I'm a bad procrastinator) Once I started reading though... I just could not put it down! Evie O'Neill has been exiled from her boring old hometown and shipped off to the bustling streets of New York City--and she is pos-i-tute-ly ecstatic. 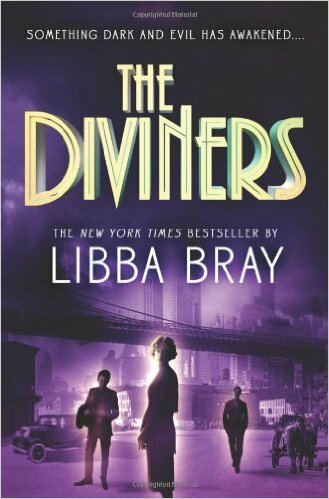 It's 1926, and New York is filled with speakeasies, Ziegfield girls, and rakish pickpockets. The only catch is that she has to live with her Uncle Will and his unhealthy obsession with the occult. 4. 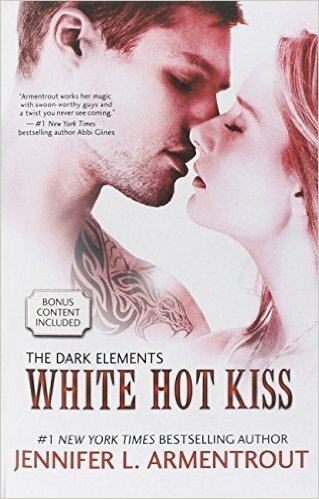 White Hot Kiss by Jennifer L. Armentrout: This is another book that I had heard numerous people talking about for a few months. I found it at my local library one day and figured, 'What the heck?' & picked it up. It took me a little while but by the end, I was hooked. 5. 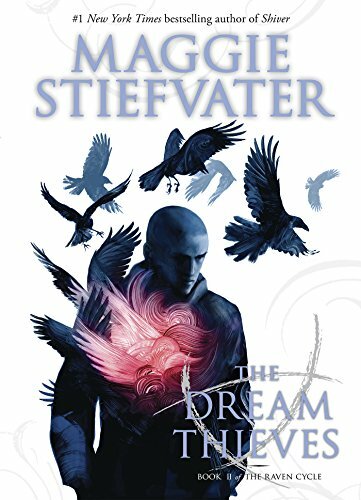 Dream Thieves by Maggie Stiefvater: After enjoying 'The Raven Boys' (first in the Raven Cycle series) I decided to continue with this second book. I've heard that this is actually the best out of the 4 in the series. I'm yet to read the other 2 but as of right now- I have to agree with the popular vote. I loved this book! Synopsis: If you could steal things from dreams, what would you take? 6. 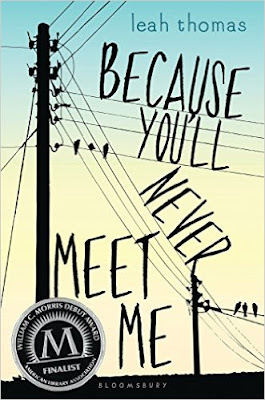 Because You'll Never Meet Me by Leah Thomas: If we're being completely honest here, I have to admit that this was a complete 'cover buy'. Even though technically I just checked it out from my library. I knew nothing about the book & chose it solely on the cover. And boy am I glad I did. Synopsis: Ollie and Moritz are best friends, but they can never meet. Ollie has a life-threatening allergy to electricity, and Moritz's weak heart requires a pacemaker. If they ever did meet, they could both die. Living as recluses from society, the boys develop a fierce bond through letters that become a lifeline during dark times--as Ollie loses his only friend, Liz, to the normalcy of high school and Moritz deals with a bully set on destroying him. But when Moritz reveals the key to their shared, sinister past that began years ago in a mysterious German laboratory, their friendship faces a test neither one of them expected. 7. 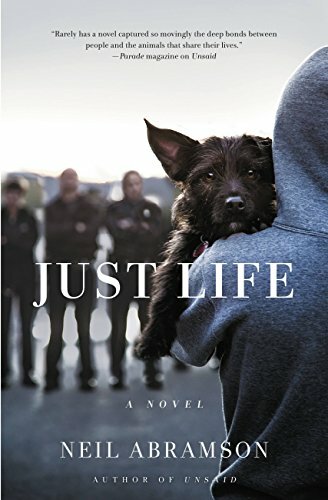 Just Life by Neil Abramson: If you follow the blog regularly, you'll know that I recently named this book my favorite read of 2016. Not only was it's plot & characters written wonderfully but there were so many lessons intertwined within the story. I'll definitely remember this novel for years to come. Synopsis: Veterinarian Samantha Lewis and her team are dedicated to providing a sanctuary for unwanted, abused, and abandoned dogs in New York City. But every day it gets harder to operate her no-kill shelter. Sam is already at her breaking point when she learns of an unidentified, dangerous virus spreading through their neighborhood. The medical community can only determine that animals are the carriers. Amid growing panic and a demand for immediate answers, suspicion abruptly falls on dogs as the source. Soon the governor is calling in the National Guard to enforce a quarantine--no dog may leave the area.